[PDF] French Creoles: A Comprehensive and Comparative Grammar (Routledge Comprehensive Grammars) [French] | Free eBooks Download - EBOOKEE! 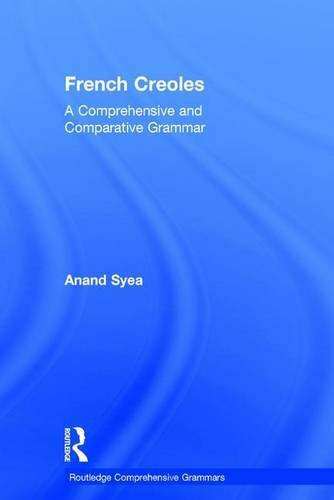 Description: by Anand Syea (Author) French Creoles: A Comprehensive and Comparative Grammar is the first complete reference to present the morphology, grammar and syntax of a representative selection of French Creoles in one volume. The book is organised to promote a thorough understanding of the grammar of French Creoles and presents its complexities in a concise and readable form. An extensive index, cross-referencing and a generous use of headings provides readers with immediate access to the information they require. The varieties included within the volume provide a representative collection of French Creoles from the Indian, Atlantic and Pacific Oceans, including: Mauritian Creole, Seychelles Creole, Reunion Creole (where relevant), Haitian Creole, Martinique Creole, Guadeloupe Creole, Guyanese French Creole, Karipuna, St. Lucia Creole, Louisiana Creole and Tayo. By providing a comprehensive description of a range of French Creoles in a clear and non-technical manner, this grammar is the ideal reference for all linguists and researchers with an interest in Creole studies and in French, descriptive and historical linguistics. About the Author Anand Syea is Reader in Linguistics at the University of Westminster, UK. No comments for "[PDF] French Creoles: A Comprehensive and Comparative Grammar (Routledge Comprehensive Grammars) [French]".